Welcome back everyone! I’ve been itching to make this card since I got the stamp set and finally got around to it. Today I’m sharing how I was able to incorporate a scene into my magic picture changer from Lawn Fawn. I have a video that you can view down below or HERE on my Youtube channel. It goes over the details a lot more! I used numerous stamp sets in my scene including You Are Sublime, So Jelly and Get Well Before and After. I stamped my images onto Lawn Fawn White card stock with Jet Black ink and colored with copic markers. Then used the coordinating dies to cut them out with my Gemini Jr.
Next, I started working on my background. I ink blended Antique Linen and Vintage Photo Distress Oxide ink for my ocean floor. Then die cut with the Stitched Hillside Borders die. My background is stenciled with Peacock Feathers with the Mini Cloud Stencil from MFT. Using a piece of Mermaid card stock I ink blended Blueprint Sketch at the very bottom and then added Peacock Feathers with my Life Changing Blender Brushes. I used the Stitched Waves Border to die cut from this piece of card stock. I attached the waves to my cloud stenciled background. Then lined up the frame from the Picture Changer Add On and ran it through my Gemini Jr. I couldn’t find my shim but it still cut most of it out. I had to trim a few edges but otherwise worked well. This is how you can incorporate your entire scene into your picture changer. The frame is cut from the background and we will use both pieces for the card. 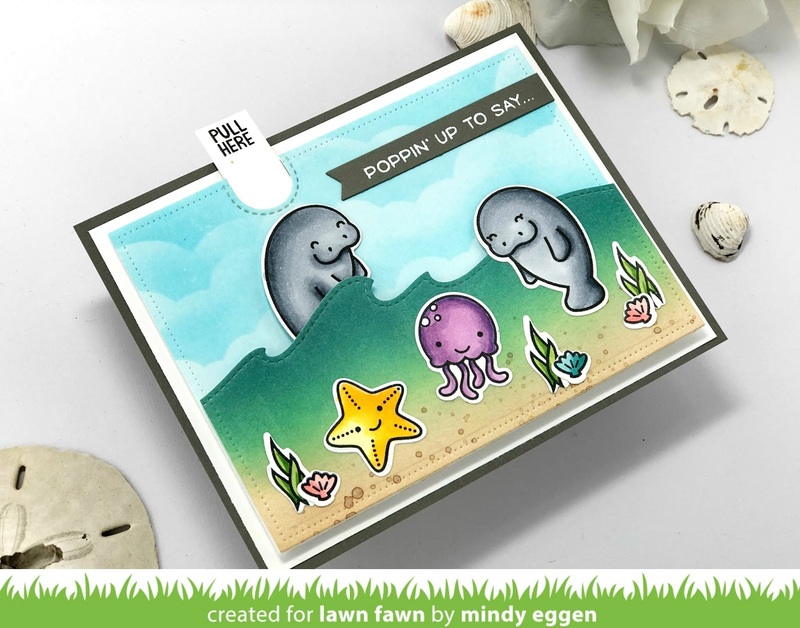 Next, I create my picture changer scene by stamping my whale from the Get Well Before and After stamp set. I created masks using Simon Says Stamp Masking Paper and attached over my image. Then ink blended Peacock Feathers and Blueprint Sketch which will match my water I created. To start assembly, I add the cloud background that I had trimmed down to 4″ x 5 1/4″ to a piece of Peacock card stock that I’ll be using as my card base. Once my magic picture changer is put together, I added it to the area it was die cut out of using a double layer of foam tape. I love how everything lines up! Then I attach the ocean bottom with foam tape so it overlaps the picture changer window a little but not enough that it will prevent my mechanism from moving. Super cool right?! The final step is adding all of my images to the scene. For the sentiment, I die cut a banner from Mermaid card stock using the Fancy Wavy Banners. I stamped the sentiment from Get Well Before and After using Embossing ink and heat embossing with white embossing powder. I have a fun idea for the turtle on this stamp set too! I hope you enjoyed today’s card. Be sure to head to my video HERE for more details on the assembly. Welcome back everyone! 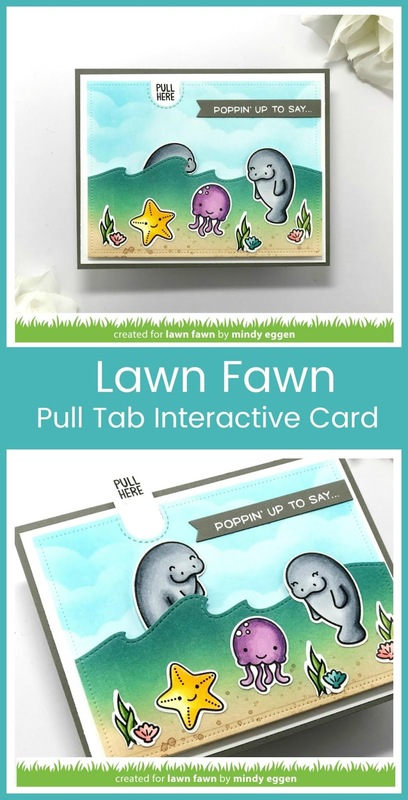 I have a fun interactive card to share with you today featuring the new Magic Picture Changer from Lawn Fawn! This is magic right here! It is so much fun to create and the possibilities are endless! I have a video you can view down below or HERE on my Youtube Channel. It’s a lot easier to explain in a video versus a blog post so be sure to check it out. For my picture changer, I decided to have my sky change from daytime to night time. I used the new Butterfly Kisses stamp set and Little Fireflies. I used Simon Says Stamp Masking Paper to create mask for my images. Then ink blended a background for each. The new Spring Fling paper pack is amazing too! The patterns just scream Spring and match perfectly! I also used the 4-bar rectangle die to cut a piece of the patterned paper to match my stitching on my card. My card base is created using the new Fog card stock which I love. It’s just a nice soft color. Be sure to check out my video HERE as it explains my process in a lot more detail. Affiliate links may be used at no additional cost to you. Welcome back everyone! Today I thought we’d get a little interactive and make a Reveal Wheel card featuring this adorable Sloth from the Slow and Steady stamp set from Neat & Tangled. I used multiple products from Neat & Tangled to create this card. To start off with, I created my background by ink blending Ripe Persimmon, Dried Marigold and Mustard Seed Distress Oxide Ink onto Bristol Smooth card stock. I then attached the Hearts Duo Stencil over it and used the same colors to stencil in the hearts. I love tone on tone looks! For the grass, I die cut the Stitched Slopes from Cilantro card stock. I then assembled my reveal wheel card using the background I created. My sloth is stamped onto Neenah Solar White card stock with MFT Extreme Black Ink and then colored with copic markers. I used the coordinating die to cut out the sloth with my Gemini Jr. I also stamped the top portion of the stamp onto pattern paper so I could trim out the flag and add to my colored image. The sentiment I lined up with one of the Skinny Strips die and added above my wheel sentiments. I wanted to add another message to the card, so I stamped Let’s Celebrate to the inside of the card using the Piece of Cake Sentiments stamp set which paired perfectly together. Here’s a look at all the fun messages this card reveals! I created a board for you to reference on the copic color combos I used for the sloth and turtle. I also have a board for the Distress Oxide Inks I used to create the background. 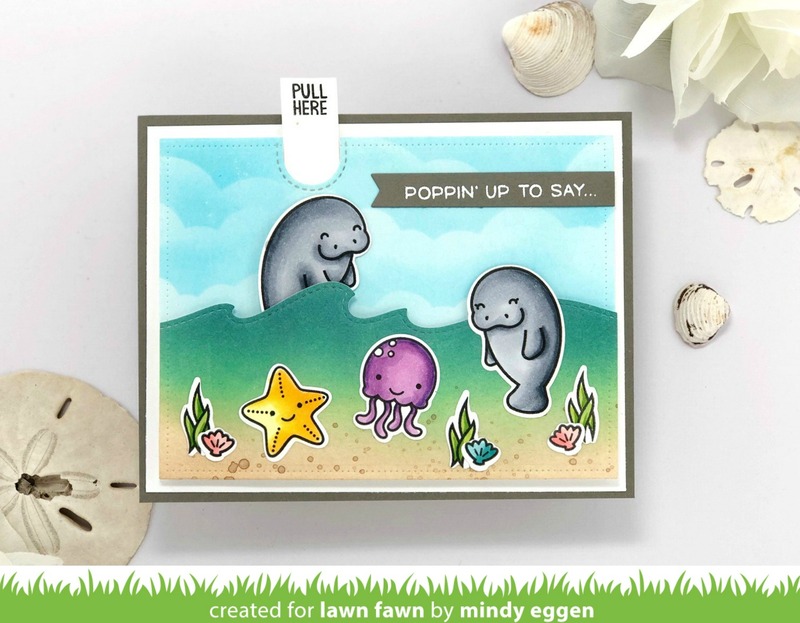 I hope you enjoyed creating this fun interactive card with me featuring the adorable Slow and Steady stamp set. I think this would be fun as a slider card too! Welcome back everyone ! 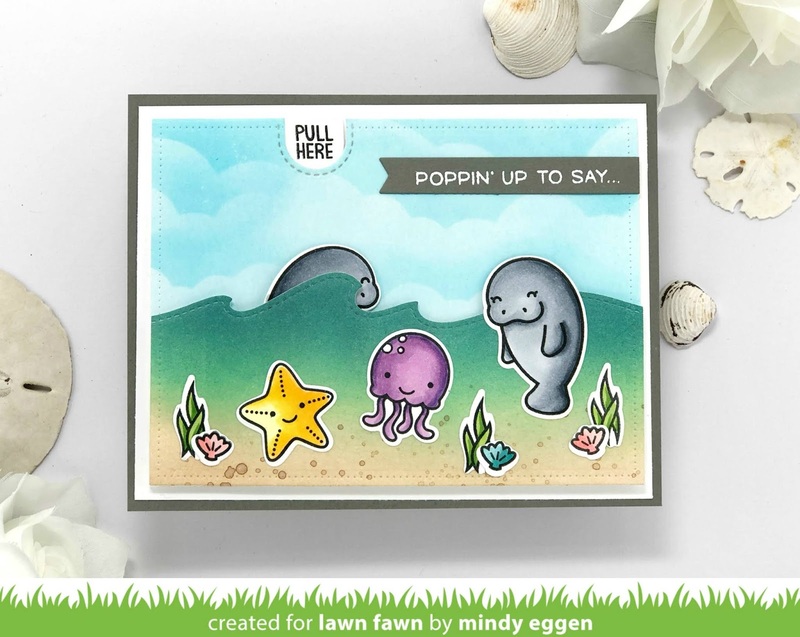 I have another fun interactive card to share combining the Let’s Toast Pull Tab Add on with the Manatee-riffic stamp set from Lawn Fawn. You can view the instructional video down below or HERE on my Youtube channel. I walk you through all the steps to complete the card. It has been super cold here and I needed to think about warmer places. That’s what inspired my card today. 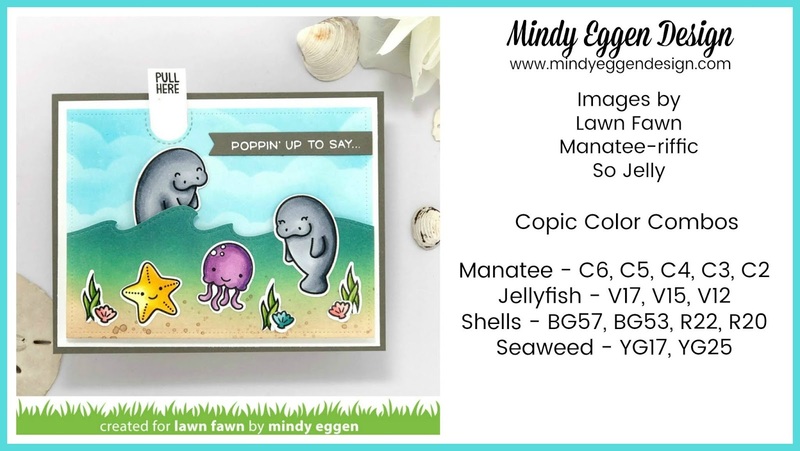 I stamped images from the Manatee-riffic and So Jelly stamp sets onto White card stock using Lawn Fawn Jet Black ink. Then colored with copic markers. I used the coordinating dies to cut them out. I created my own stencils for the clouds by die cutting the Puffy Clouds from card stock or you could use Acetate. I then used Mermaid Lagoon to stencil my clouds into the background. My ocean bottom was created by ink blending Antique Linen and Vintage Photo Distress Oxide ink. I then smooshed the Vintage Photo ink onto my craft mat, spritzed with water and flicked the mixture onto my ink blended sand. The waves portion was created by ink blending Twisted Citron, Peacock Feathers and Chipped Sapphire. I then trimmed this out by using the Stitched Waves die. 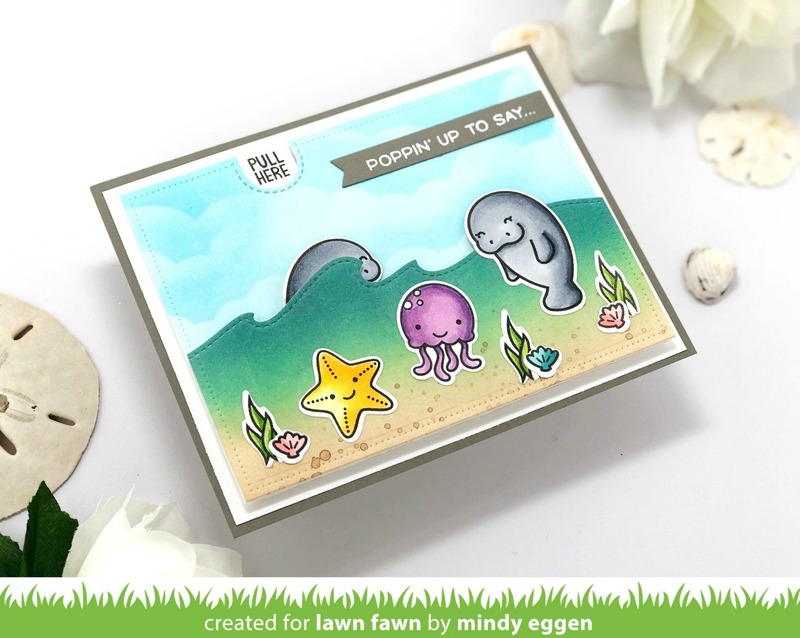 I used the Let’s Toast Pull Tab add on die to add a manatee behind the waves and adhered the rest of my cute critters to the front. I love using this Add On with different scenes! I stamped the sentiment onto the tab using the Push Here stamp set. I finished off my card by stamping the sentiment onto Narwal card stock and heat embossing with white. Then die cut using the Everyday Sentiment Banners. Be sure to check out my video HERE that goes through all the steps and exact products used. Hope you enjoyed taking another look at how to use this die. It’s so much fun! Affiliate links are used at no additional cost to you. Click on the picture below to purchase the product. Thanks so much!